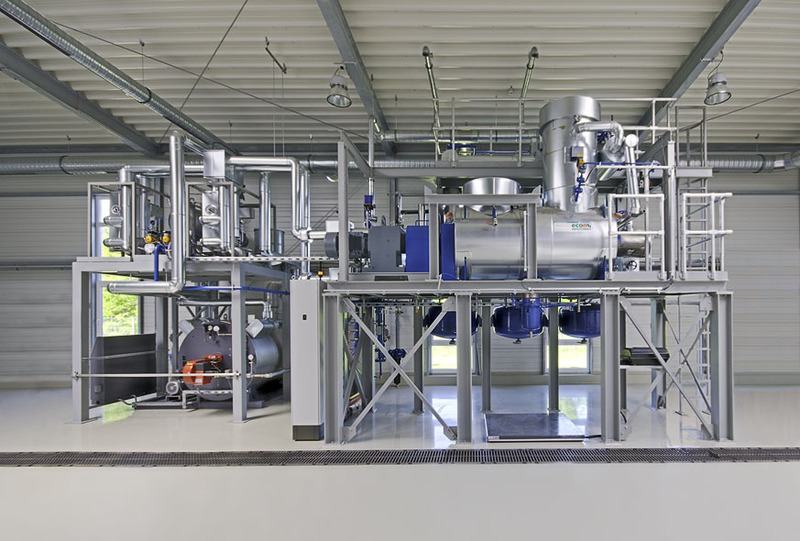 The VacuDry® system is available in different sizes with different throughput capacity. Depending on the needs of our costumers we decide which is the best option. VacuDry® plants are equipped with a varying number of vacuum dryers, totalling a gross volume of 1,500 to 12,000 litres. The dryers work in a batch-wise process. The batch time depends on the feed material consistency, as well as various adjustable parameters and operating conditions. The underlying design of a VacuDry® vacuum dryer is a still-standing and indirectly heated chamber with a heated, horizontal, slowly rotating mixing shaft inside the chamber. The shaft is equipped with slow moving mixing shovels, which are able to perfectly homogenize the material and ensure optimum heat transfer. The vacuum-tight sealing at the rotating shaft ensures a vacuum down to < 50 mbar (abs) during the process. 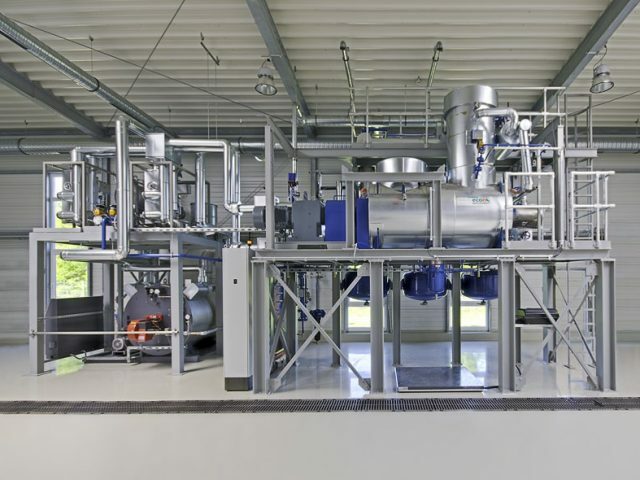 This vacuum technology allows a very low level of energy consumption to be achieved. After the contaminated material is filled in the dryer, the evaporation process begins. The maximum feeding amount of the vacuum dryers is detected by level measurement sensors. The first evaporation stage is the water evaporation phase. The water evaporates at material temperatures between 95 °C and 110 °C at an absolute pressure of 800 mbar (abs). In the following phase, all other contaminants with boiling temperatures under 450 °C (under normal pressure) will evaporate. During this stage, a high vacuum down to < 50 mbar(a) is applied while the heating is set to the maximum required temperature. This temperature depends on the physical characteristics of the contaminants. 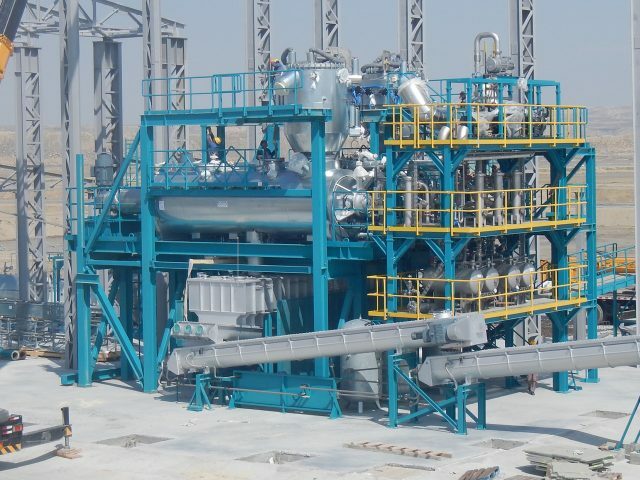 This ensures low energy consumption, low process emissions and a first-class quality of the recovered resources. The treatment method involves a physical separation process. As a result of this, the characteristics of the recovered resources stay unchanged – guaranteeing materials (drilling fluid, high-alloyed metal, mercury…) all in first-class quality. After the required final operating parameters have been reached (particularly temperature and vacuum) the evaporation process is completed. The vacuum gate valve and the vacuum dryer flap at the bottom will open, and the cleaned material is discharged into a storage & cooling bunker. The newest VacuDry® plants come in a standardized package, with its own integrated weather protection/ housing. The main steelwork components are used for both equipment and housing supports. VacuDry® housing is designed and made in Germany meeting highest wind, earthquake, and quality standards.